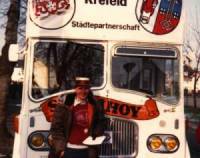 The 450mile marathon bus journey to Leicester's German twin city, Krefeld is almost over. I and 25 hardy twinners set off aboard an open-topped double decker bus yesterday evening. We are due to arrive in Krefeld at 2.30 p.m. German time. Meeting up with us will be another 10 slightly adventurous members who travelled by car. Yesterday's brief thaw ensured clear motoring from the Town Hall to the ferry at Felixtowe, with the 19-year-old bus, top speed 43 m.p.h., going nearly flat out all the way. The bus might have the looks, but it definitely lacks luxury and, as we sedately swallowed up the miles, everyone suffered saddle soreness. Champion town crier Norman Roberts suddenly remembered why this was his first bur ride for 30 years. Any flagging spirits were soon lifted by a quick burst on the banjo by a member of the Hiss and Boo Band, who soon had us all singing - though not usually at the same time. Thankfully his suggestion of a worst passport picture competition was taken up. 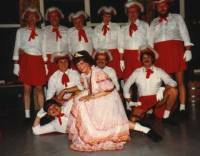 Carnival time in the Rhineland of West Germany is a week of eat, drink and be merry. Richard Wallace reports. Imagine every pavement, pub, tree and window ledge in and around Leicester city centre packed solid with people. You will then have an idea of the size of yesterday's Krefeld Carnival procession in which the city was represented by more than 36 members of Leicester's Twinning Association. More the 200,000 people lined the street and hung from every possible vantage point to watch a huge procession of floats of all sizes pass around the city centre. Each float, big or small, received an individual cheer from all parts of the crowd and everyone was showering ticker-tape and confetti. Our own Hiss and Boo Band braved a bitterly cold wind to keep up a steady flow of music throughout the procession. A few bars of When the Saints go Marching in, seemed to cause mild hysteria. Once the procession was over people again moved into the bars to continue the celebration and the local council began a massive clean-up operation to clear the mountains of debris left behind. It was quite a party ... and it still has another day to go. 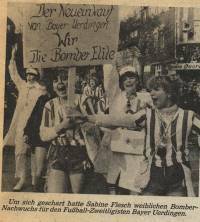 As the week-long Krefeld Carnival begins to wind down for another year, the Leicester twinners started the long trek home. Invited for the first time to officially represent the city during the carnival, the group experienced German hospitality to the full. Last night's final fling in the bar on the edge of town was no exception. 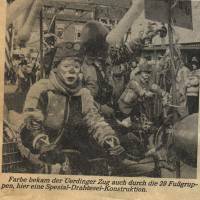 The carnival is a tradition restricted to Rhineland towns, and the climax of the festivities is the ceremonial burning of the effigy of the clown prince, spirit of the carnival, loosely similar to our Guy Fawkes. Throughout the carnival effigies of the prince are perched in bars, restaurants - even hanging from street hoardings - to signify the continuation of the carnival.